This is a checklist for 4th grade math TEKS. These are the NEWLY adopted TEKS.This product is AWESOME to track data in the classroom! This is a checklist for 6th grade math TEKS. These are the NEWLY adopted TEKS. This is GREAT to track data in the classroom. TEKS Tracker Game Board - 5th Grade Science This can be used by individual students. It goes with rockstar or music theme! This is a way for your students to track their data for the STAAR test. It has every TEK both readiness and supporting standards. Students can keep track of the progress made learning and mastering new TEKS. Excellent reference for preparing for STAAR Test. This is a checklist for the Fourth Grade Math Texas Essential Knowledge and Skills. It has a checklist for four grading cycles. 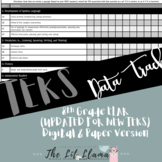 You can use this to track when you have covered or assessed each math TEKS. Help your students track their progress on the mastery of the TEKS and then reflect on their mastery. Easily track your third grade students' progress with this achievement chart. It is broken up by reporting category to help see where your students are struggling.